Announcing four new tablets, Asus chairman Jonny Shih says that the company plans to stand out from the tablet crowd by trumping others on choice and innovation. "We admire companies like Apple who offers great innovation but they provide very limited choices for the customers. 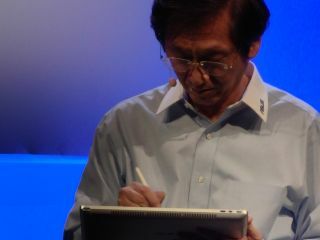 Different kinds of customers have different kind of needs, so they want choice," said Shih at Asus' CES 2011 press conference attended by TechRadar. "Other companies provide choices but they do this from a position of low innovation. Asus provides the best of both worlds." The company unveiled Android Honeycomb and Windows tablets, with and without keyboards, in three different screen sizes and at prices from $399 to $1099. Between the Eee Pad Slider, Eee Pad Transformer, Eee Pad MeMO and Eee Slate EP121 Asus thinks it has something for everyone. The Android tablets all come with Asus' MyWave interface, which has tools like the MyZine ebook and e-magazine library, and WaveShare, a wireless DLNA client that lets you play music and 1080p video on other devices, such as your notebook or connected TV. Asus also talked up other innovations: AsusPro business notebooks with batteries that charge in 30 minutes, TUF series motherboards with 'thermal armour' and ruggedised components, Republic of Gamer motherboards that pair with 450Mbps dual-band wireless routers and the Vulcan active noise cancellation headset. Beyond that will be WaveFace, which Shih calls "an uninterrupted seamless mobility experience; no matter where you are - at home, on the go, in the office, in a café…"
WaveFace is something Asus is still working towards but it's going to be a key part of Shih's long-term vision of where personal computing is going, which isn't just using a tablet to consume content – it's using computers as a second, silicon brain, which means inputting plenty of information. "So the input from those humans is going to be what the silicon brain cannot do well. That's the beauty of Web 2.0; that's why [services such as] Facebook, Twitter, Wikipedia and online gaming prevail. And then you add the 'Internet of things'; we put the second brain, the silicon brain into things and we can sense them, we can control them." The benefits are pretty practical, he thinks. "How to make all people enjoy the best digital life in real time and in a real place – so knowing where you are and showing you where are your friends, where is the parking space…"
And that comes back to a combination of personal devices and the power of the cloud – although Shih suggests quite seriously that families are going to need a "home CIO" to set all of this up and achieve this vision of "the new personal cloud computing era"; he dubs it DIY 2.0 and promises helpful services and online training from Asus. But it starts with tablets you can use for more than watching. "We believe you need to have the best personal cloud computing devices with wide choices that support very good input so they can really contribute to productivity and the 'internet of things'".